Dear : :-) Please note, you do not have to pay extra freight, we can not provide tracking code, we can only through the envelope sent to you. https://www.ebay.com/itm/Waterproof-Tracking-number-by-HongkongPost-ChinaPost-SingaporePost-filter-/151795092724?ssPageName=STRK:MESE:IT This is an article of insurance, you can check the status of your cargo transport, we recommend that you buy it, if your address more remote, or if your address does not often receive international cargo record. Description: 1. Our step-up / step-down rings are made of premium grade aluminum precision. Every ring is inspected to ensure smooth mounting..
~ · 37-49-52-55-58-62-67-72-77-82-77-72-67-62-58-55-52-49-37 The ring adapter easily screws onto the front of any lens, and converts the thread size of your lens to the thread size of any other accessory (such as filters, hoods, flashes and lens converters).Made of high quality anodized black aluminum (metal). Color: Black. Extremely solid and lightweight. Specifically designed for your camera for a tight and secure fit. No wobbling or cross-threading. Your camera's lens thread size will be marked somewhere on the lens barrel. This number is always preceded by a "Ø" (diameter) symbol..
52mm to 52mm 52-52 mm Female to Female Coupling Ring Adapter For Lens Filter. · Female thread: 52mm. · Female to Female Lens Filter Ring Adapter x1. · CPL UV ND Star Filters, Adapters, LENS, LENS Hood, LENS CAP, and more. 37-49mm step-up ring x1. 49-52mm step-up ring x1. 52-55mm step-up ring x1. 55-58mm step-up ring x1. 58-62mm step-up ring x1. 62-67mm step-up ring x1. 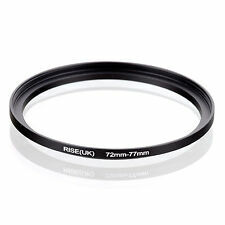 67-72mm step-up ring x1. 72-77mm step-up ring x1. The49mm-58mm ring adapter easily screw in any 49mm lens, and converts the thread size of your lens to the thread size of any other58 mm accessory (such as filters, hoods, flashes and lens converters). Description Note: IF you want a tracking number,pls chose the Standard Int'l Shipping for the economy int'l shipping,we are free shipping but haven't tracking number Any problem,welcome to contact me,thanks! New 72mm to 77mm Step-Up Ring Adapter metal Quantity: 1. The female thread to filter: 77mm. Material: Aluminium alloy. Special aviation aluminum alloy, high strength, impact resistance, twist and pressure. Machining process. Step Up Filter Rings only, other accessories demo in the picture is not included! The ring adapter easily screws onto the front of any lens, and converts the thread size of your lens to the thread size of any other accessory (such as filters, hoods, flashes and lens converters)Color: BlackExtremely solid and lightweightSpecifically designed for your camera for a tight and secure fitfor Nikon DC147Material:Black aluminumNo wobbling or cross-threading.Your camera's lens thread size will be marked somewhere on the lens barrelThis number is always preceded by a inch ? inch (diameter) symbolFor example:37 = 37mm lens thread sizeThis number can also often be found printed on the back side of your lens capThe first number is always the lens thread size, the second number is the filter size of the accessoryIf the first number is bigger, it's a s.
The 40.5mm-52mm ring adapter easily screw in any 40.5mm lens, and converts the thread size of your lens to the thread size of any other52 mm accessory (such as filters, hoods, flashes and lens converters). 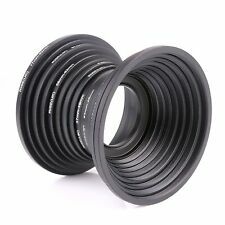 49mm to 49mm 49-49 mm Female to Female Coupling Ring Adapter For Lens Filter. · Female thread: 49mm. 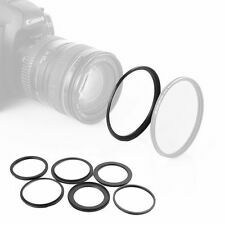 · Female to Female Lens Filter Ring Adapter x1. · CPL UV ND Star Filters, Adapters, LENS, LENS Hood, LENS CAP, and more. The49mm-55mm ring adapter easily screw in any 49mm lens, and converts the thread size of your lens to the thread size of any other55 mm accessory (such as filters, hoods, flashes and lens converters). Compatibility: Cokin P Series filter. slot your adapter ring into the front of the holder and simply screw to the front of your lens. you will need an adapter ring (not included) to mount the holder to your lens. Ring is a small back up gauge ring conversion adapter. Mm-52 1x49mm Step-up Ring. Mm-55 1x52mm Step-up Ring. Mm-58 1x55mm Step-up Ring. Mm-62 1x58mm Step-up Ring. Mm-67 1x62mm Step-up Ring. Mm-72 1x67mm Step-up Ring. The female thread to filter: 55mm. Material: Aluminium alloy. Special aviation aluminum alloy, high strength, impact resistance, twist and pressure. Machining process. Step Down Filter Rings only, other accessories demo in the picture is not included! The female thread to filter: 52mm. Material: Aluminium alloy. Special aviation aluminum alloy, high strength, impact resistance, twist and pressure. Machining process. Step Up Filter Rings only, other accessories demo in the picture is not included! Note: IF you want a tracking number,pls chose the Standard Int'l Shipping for the economy int'l shipping,we are free shipping but haven't tracking number Any problem,welcome to contact me,thanks! The male side ( to the side of the camera ) : 40.5mm The female side ( to the side of the lens) : 52mm Made of metal ( not plastic ) Color: black Quantity: 1 pcs Suitable for access a wider variety of filters, adapters, hoods and more… Package Included: 40.5mm - 52mm Filter Ring Adapter x1. 67mm - 82mm Filter Ring Adapter x1. The female side ( to the side of the lens) : 82mm. To Fit Lens Front : 67mm. ◈ Step Up Down Adapter Ring. M42 Lens to Canon EOS EF Mount Adapter Ring 1100D 600D 60D 550D 5D 7D 50D N.
Features: Made of metal (anodized Aluminium), not plastic Colour: Black Have two male threads Brand new, newer used Description: Can be used in wide variety, for example, as macro reverse adapter ring - screw on your lens and you can attach another lens (in reverse) to your main lens. packege： 1*52mm-58mm Male to Male Ring Brand RISE(UK) MPN Does Not Apply Material Metal Colour Black UPC Does Not Apply Type Male to Male Ring Model 52-58 UPC Does Not Apply. 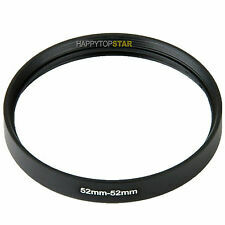 * Camera Repairing 46mm to 52mm Metal Step Up Filter Ring Adapter. * Adapter ring is suitable for filters, close-up lenses and other attachments to lenses with different filter thread sizes. * The Bower 46-52mm Step-Up Adapter Ring easily screws onto the front of any 46mm Lens, and allows you to convert to the 52mm threads of accessory items (such as filters, hoods, flashes and lens converters). Brand Unbranded MPN Does not Apply UPC 4894462031100. Dear : :-) Please note, you do not have to pay extra freight, we can not provide tracking code, we can only through the envelope sent to you. https://www.ebay.com/itm/Waterproof-Tracking-number-by-HongkongPost-ChinaPost-SingaporePost-filter-/151795092724?ssPageName=STRK:MESE:IT This is an article of insurance, you can check the status of your cargo transport, we recommend that you buy it, if your address more remote, or if your address does not often receive international cargo record. . The female side ( to the side of filter/Hood/Cap) : 67mm. The52mm-67mm ring adapter easily screw in any 52mm lens, and converts the thread size of your lens to the thread size of any other67 mm accessory (such as filters, hoods, flashes and lens converters). The49mm-62mm ring adapter easily screw in any 49mm lens, and converts the thread size of your lens to the thread size of any other62 mm accessory (such as filters, hoods, flashes and lens converters). The male side ( to the side of the camera ) : 37mm The female side ( to the side of the lens) : 52mm Made of metal ( not plastic ) Color: black Quantity: 1 pcs Suitable for access a wider variety of filters, adapters, hoods and more… Package Included: 37mm - 52mm Filter Ring Adapter x1 Brand RISE(UK) To Fit Lens Front 37mm Steps Up/Down to 52mm MPN Does Not Apply UPC Does not apply Model 37-52. Features: Made of metal (anodized Aluminium), not plastic Colour: Black Have two male threads Brand new, newer used Description: Can be used in wide variety, for example, as macro reverse adapter ring - screw on your lens and you can attach another lens (in reverse) to your main lens. packege： 1*52mm-55mm Male to Male Ring Brand RISE(UK) MPN Does Not Apply Material Metal Colour Black UPC Does Not Apply Type Male to Male ring Model 52-55 UPC Does Not Apply. The 37-62mm ring adapter easily screws onto the front of any 37mm lens, and converts the thread size of your lens to the thread size of any other 62mm accessory (such as filters, hoods, flashes and lens converters). The 67mm-58mm ring adapter easily screws onto the front of any 67mm lens, and converts the thread size of your lens to the thread size of any other 58mm accessory (such as filters, hoods, flashes and lens converters). Weight : 14g Package Content : 1 x Step Down Adapter Ring Brand Unbranded MPN Does not Apply UPC 4894462306499 EAN 4894462306499 ISBN 4894462306499. The female thread to filter: 58mm. Special aviation aluminum alloy, high strength, impact resistance, twist and pressure. Machining process. Material:Aluminum Alloy. Color: Black. We will do our best to help you to resolve your problems. 58mm - 72mm Filter Ring Adapter x1. The female side ( to the side of the lens) : 72mm. To Fit Lens Front 58mm. 58mm Flower Shape Lens Hood For Canon EOS 1100D 650D 550D 600D 500D 450D 18-55mm. Neck strap &Wrist Arm Strap. Comaptible with Cokin Z series. Filter holder for Cokin Z series X 1. This filter holder is specially designed to be very flexible for 2x 4x4" or 4x5.65" filter.It can hold any 4x4",4x5.65"(100mm) filters with 1mm,2mm,2.5mm,3mm thickness. Introduction: This lens mount adapter allows any 52mm lens become a Marco lens on Pentax PK K camera body. Therefore, you don't need to buy any Marco lens. Although the lens will fit physically, automatic diaphragm, auto-focusing, or any other functions will not operate correctly while using this adapter. 52mm Male thread Brand new, never used Made of metal (not plastic) color : black Package includes: Macro Reverse Adapter Ring x1 Suitable For Pentax K/PK camera body . Special aviation aluminum alloy, high strength, impact resistance, twist and pressure. Machining process. Ultra-low chemical residues, attached to a solid! Included: 8 x Step Up Rings. 49mm-52mm Step-up ring x 1. Produktname: Step Up Adapter Ring Objektivseite: 58 mm/ 2.28" Filter Seite: 62 mm/ 2.44" Gesamtgroesse: 64 x 7 mm/ 2.5" x 0.28" (D * T) Material: Metall; Farbe: schwarz Der 58mm-62mm Ring-Adapter kann an der Vorderseite jeder 58mm-Objektiv einfach geschraubt werden, und wandelt das Gewinde des Objektivs auf die Gewindegroesse anderes 62mm-Zubehoer (wie Filter, Abzugshauben, Blitze und Objektive). Gewicht: 6g Paket-Inhalt: 1 x Step Up Adapter Ring Hinweis: Wegen der Lichtstrahlung und Bildschirme koennte der Farbe Ton in den Fotos sowie des tatsaechlichen Produkts etwas unterschiedlich sein. Der erlaubte Messfehler ist 1Â±3 cm. Marke ohne Marke MPN Nicht zutreffend UPC 4894462306468 EAN Nicht zutreffend ISBN Nicht zutreffend Brand . The female thread to filter: 77mm. Middle East. Color: black. High quality ! The more you buy, the more you save.